Recently we bought several tins of the tasty mollusk, crabmeat and enjoyed it with creamy eggs. Today, I am combining some crabmeat with canned cream corn to make a delectable soup. Over a million tons of crabmeat are eaten annually and we are doing our part. We always have canned cream corn in the pantry for outdoor cookouts and it makes this soup an enthralling, taste-bud satisfying delight. Crabmeat is very versatile and for soups one can make chowder or a cream soup. I particularly like an oriental recipe I found a few years ago because it is loaded with flavour. If you like crabmeat you will like this creamy Asian soup. This dish is adapted from Ellen Dong’s recipe in the Chinese Consolidated Benevolent Association Cookbook, Augusta, Georgia. * If your purse allows, add some chunkiness with a little fresh lump crabmeat. ** I have a jar of lobster base in my pantry. One time I had no seafood stock (such as shrimp broth from shells) so I used chicken stock with a teaspoon of the lobster base. It was delightful but chicken stock alone is fine. 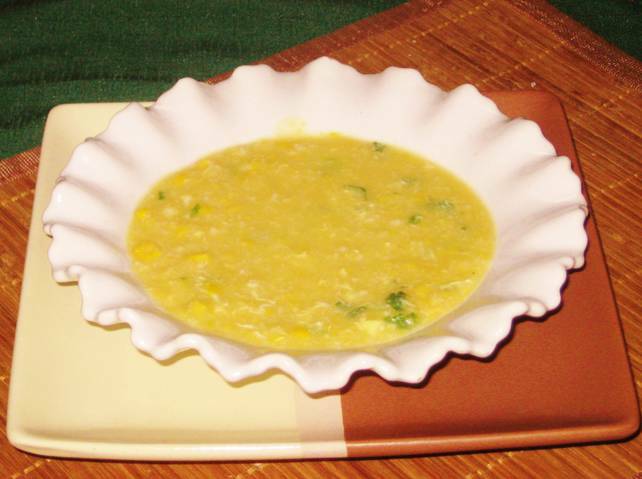 We are very keen on this soup for its preparation simplicity. It is intriguingly delicious in flavour and has an alluring aroma. Please don’t serve this sumptuous soup to too many diners at once because all the Mmmm-ing around the table may be a distraction. KATHY STEMKE: Nice photos? NICE? They are fantastic photos, as you should know because you took them. We certainly enjoyed eating this soup. Of course there was no dinner conversation because we couldn't stop "Mmmmm ing". I love you sweet baby girl. Oh my gosh Anthony!!! Everytime I come to this blog, you make me drool. As soon as I can find a can of creamed corn that they don't add sugar to, I am going to try this. We live in such a small town that I have to wait until I go to either Erie or Pittsburgh to look. MY JOURNEY WITH CANDIDA: Good point My Journey, they put all manner of stuff in cans, corn sugar, salt etc. Although you may make your own creamed corn, it might not be worth the hassle to you. At any rate, continued best wishes on your alkaline regimen. Unmmm, this must be very good. PS, if my picture you can see a figure but varies according to the person who looks and your imagination. The soup looks awesome. It makes it so much easier to go with canned crab, than cleaning out steamed crab to get to the meat! CHANDRANI: Thank You for saying so. LEOVI: I'm sure you are right, each viewer has a different perspective. MALLI: You are 100% correct, that is what I like about it, using the canned crabmeat; otherwise purchasing the fresh is expensive. The soup sounds yummy. Something I'd enjoy, but not so sure about my guys. MISHA GERICKE: Chicken is very good too; crabmeat used instead has a more delicate and fragrant flavour. Good luck with meeting your goals. 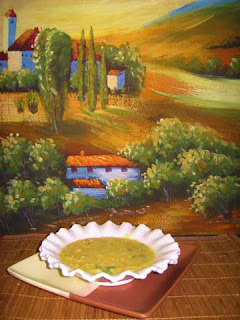 SUSANNE DRAZIC: I cannot imagine why your guys wouldn't clamor for this soup. Its a tasty and for you, hasty. DAWN @LIGHTEN UP: You got that right! Whenever I stop by here I always find something else that sounds really good! Ooh, this sounds interesting. I had no idea you could buy crab meat in cans. This is good news. THE GOLDEN EAGLE: Thank you for your genial compliment, I appreciate them. NICKI ELSON: Yes, not as expensive as one might think. Thanks for calling. This sounds so good! I rarely make soup from scratch because I'm a bit of a lazy cook. This may get me motivated though! Thanks for calling me a good mom. I appreciated it! Any tips about cognitive exercises for toddlers? I know you guys homeschool so I thought you might have some ideas. CHATON: Yeah, what's good is the ease of preparation here. The toddler selected the Yo toddler because (Ithink) he recognized it from earlier. The Chobani, to her, had no meaning, couldn't read the label, it might as well have been Baby Chocolate. The Educated Tipster can very definately help you. Thanks for calling good mama. NUTSCHELL: What a lovely comment, Thank You so much. WOW this looks absolutely incredible. It helps that it's below zero outside, but STILL. I have a few crabs left in my refrigerator and was searching for a new recipe to feed my family. This one looks perfectly appetizing! This soup sounds amazing. I know that I would love it. I've made something similar to this (without the crabmeat)and it was wonderful! I'll have to try it with crabmeat next time. JOLENE: Yes indeed, cold weather is conducive to soup eating. Thanks. PURABI NAHA: I'm sure you will enjoy this crab/corn combination. Thanks for calling. WORDS OF DELICIOUSNESS: The key to this soup is in your name - Delicious. My husband Jim wants a bowl of this RIGHT now!!! Wow did you get him interested -- it is only 8:12 AM! KMCKENDRY: This will surely please you. LYNDRA R YOUNG: When you put the crab in you'll be delighted with the flavour. Oh, gosh, I am just imagining the deliciousness of this soup! I like the idea of adding a little lobster base to some chicken broth...nice tip! HEMALATA: Pick up a can near the canned tuna and sardines, it's nice to have on hand. Thanks for calling. I am adding your blog to my favorites since I, too, love to cook. I might try some of your yummy recipes. CLAUDIA DEL MALSO: Lynda R. Young is a brilliant woman, you are smart to watch her. Thank You for calling, hope to see you often. this will sure be delectable. i need to flag this! tell me ginger root is equivalent to ginger or something totally different? THE JUNKIE BOOK: Gingerroot IS ginger. I say gingerroot to distinguish it from powdered ginger. Fresh ginger, aka gingerroot is that gnarly beige tuber. So, to make a long story short,yes,it is equivalent. Try this with left over chicken. Dice up the chicken add ginger with the frothed egg white and corn starch, then add it to the broth and cream corn. YUM YUM Then add the chopped up green onion. SCOTT O'CONNOR: Yeah, that's a great variation, Turkey too. Thanks for your input.